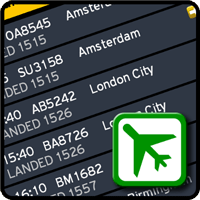 Flighty gives you the latest arrival and departure times for all major UK and Irish airports. The app is very easy to use and supports multitasking so you can switch to it easily without having to reload. You can also find your flight by searching the arrival,destination or flight number. Note: Although we strive to get the most up to date arrival and departure information we cannot be held responsible for any losses (financial or otherwise) caused by the use of this app.